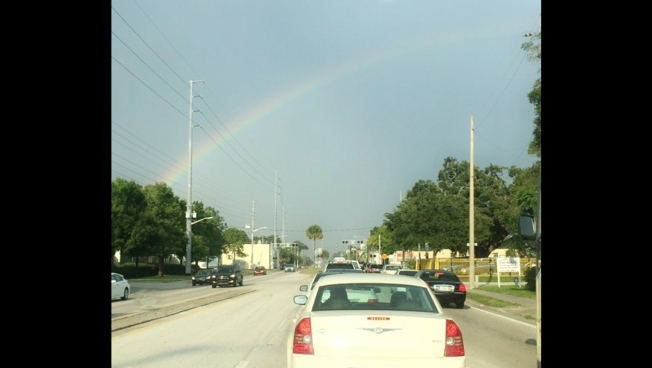 People in Orlando, Florida, reported seeing a rainbow in the sky June 14, 2016, two days after the massacre at a popular gay nightclub in the city. Many said it appeared the rainbow was hanging over the club, called Pulse. A rainbow appeared over the city of Orlando Tuesday night, according to social media posts, a sight many of them took as a symbol of hope two days after one of the country's worst tragedies. The images showed a rainbow shining in golden light in front of dark clouds. Some said it seemed to come directly from Pulse nightclub, where a heavily armed gunman killed at least 49 people Sunday, the deadliest mass shooing in U.S. history. Twitter user @AlexaScore used the hashtag #OrlandoStrong when she posted a photo of the rainbow. She said she was going to her gym near Pulse "and this rainbow is hanging over the nightclub." Rainbows have been used the world over — hanging over the historic Stonewall Inn in New York and draping the Eiffel Tower in — as a symbol of solidarity with the attack on the popular gay nightclub. Still reeling from the shooting, the city held a prayer service Tuesday night as well. Orlando Mayor Buddy Dyer said he was uplifted by the way the community has come together as more than a thousand people — including many clergy and local, state and national civic leaders — met Tuesday night at First Baptist Orlando to hold a vigil for the shooting's victims. Dyer said to the crowd: "We will not be defined by the act of a hate-filled killer. We will be defined by our love, compassion and our unity." NBC Southern California's Irene Moore contributed to this report.